Set in 2016 in a decimated Los Angeles, Terminator Salvation the video game is meant to connect the leap between Terminator 3: Rise of the Machines and Terminator Salvation the movie. 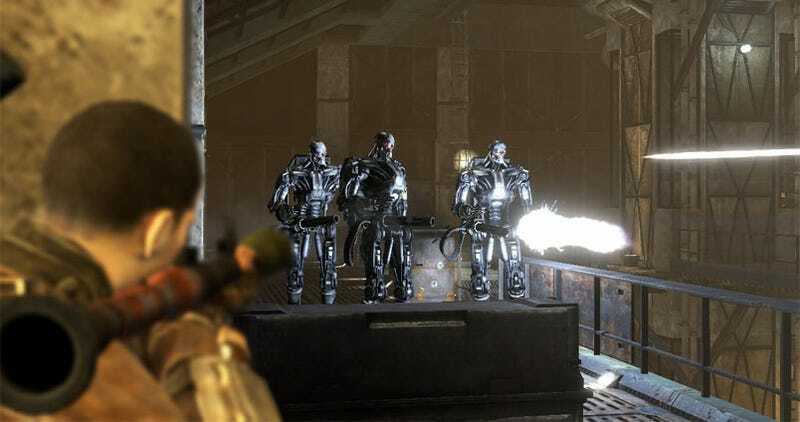 The third-person shooter has gamers taking on Skynet and its army of robots as they fight to save a group of soldiers lost behind enemy lines. The Terminator and its red eyes has already spawned nearly two dozen Terminator themed video games. Can Terminator Salvation set itself apart... in a good way? Cover Yourself: Terminator Salvation has a fairly robust cover system. That's because they expect you to use it in most encounters with the different bots you'll be going up against. You press a button to stick to cover and then push the thumbstick in a direction to see if you can move to nearby cover. While other games have done this before, I've never seen a game that allows you to move around an entire map almost entirely in cover. Vehicular Homicide: The most enjoyable moments in the game are when you're not walking, but riding in the back of a truck or buggy or piloting an over-sized robot. These moments are few and far between and relatively short, but fun when they happen. No Diversity: There seem to be less than half a dozen guns in this game. You also get grenades and pipe bombs. And that's it. But that's OK, because you're really only facing four types of enemies. Sure you'll see a few others and there are a couple of boss battles, but this is one sparse, unimaginative war going on. Objective Confusion: The minimalist heads-up-display does little to help this game. Since you have no radar and no objective indicator you have to make sure to follow your teammates, teammates who either constantly run well ahead of you or stick so far behind they don't seem to like your company. Even more frustrating are the moments—the many moments—when you're getting peppered with enemy fire but you can't figure out where the gray enemies, which often blend into the rubble of the landscape, are. Voice Acting and Plot: The voice acting in Terminator Salvation is just horrendous. It sounds like the lines were read, not acted, and recorded. It's the first time I've played a video game and really noticed the disconnect between the dialog and the avatars that are supposed to be speaking it. The plot, as short as it is, is completely free of twists, turns or nuance. You need to save a bunch of guys, killing robots on the way to your goal. End of story. Cut Scenes: Created with the game engine, the cut-scenes at times look better and at other times worse than the gameplay itself. The scenes are often blurry, murky affairs with distractingly bad lip-syncing and no real emotion. Short, Not Sweet: It took me just under three hours to blast my way through the game on the easy setting. That included getting lost and confused about my objectives a few times. I went back and played a few levels on the hardest setting and the only difference seemed to be the number of shots required to put a bot down. Bad AI: One of the big points of this game is that you have to work in concert with your teammates to take down many of the enemies. That entails laying down cover fire into the front of a terminator while someone sneaks around behind it to blast its weak spots. Neat idea, and when it works it's sort of fun. But when the friendly AI just refuses to help you out it becomes an exercise in tedium. Narrow Paths: It doesn't take long to realize that much of that vast landscape of destruction is off limits to you. The game piles up cars, rubble and buildings to make sure you can't stray very far from the beaten path. There are entire levels that look more like mazes than cityscape because the path is so narrow. Terminator isn't a horrible game, but it is a bland one. The third-person shooter does little to set itself apart from other shooters or other Terminator games. The encounters with robots are so expected, so similar to one another that the game feels more like a job than a diversion. Terminator Salvation was developed by GRIN and published by Equity Games and Evolved Games for the PC, PlayStation 3 and Xbox 360. Released on May 19th. Retails for $59.99. Played Xbox 360 version. Completed story mode on easy difficulty, replayed through multiple levels on hard difficulty.